and 20% off quantities of 20+ of the same sized bag. Use as a produce bag or nut milk strainer. 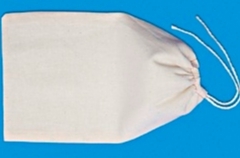 Breathable cotton bags prevent spoilage. Pack and ship kits, products and samples economically. Keep small things together. Tie to larger parts of shipment.